What does being an Apologist mean? Dr. Reagan and I on our ministry's television show Christ in Prophecy had the pleasure of asking this question of Eric Barger of Take a Stand! Ministries. Eric is an authority on the cults, the New Age and rock music today. From his past as a former drug addict and rock n' roll musician who was deeply involved in the New Age movement, Eric has emerged since he gave his life to Jesus Christ to become one of today's greatest defenders of Christianity in America. He joined us to talk about the greatest threat to the Church today — apostasy, particularly from the Emergent Church Movement. 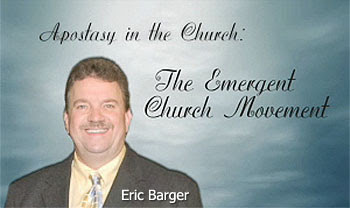 Eric Barger: I have a pastor friend of mine who I've known for many years. He's really a mentor to me. He wrote just a terrific reference letter for me which I didn't ask for, but it just came in the mail. I was just so blessed that he said so many wonderful things about me. He said, "Eric Barger is the greatest apologizer you will ever find. Bring him to your church and take him around town and he will apologize for everything." It was a spoof letter! We had a lot of fun with that, though. Well, the term Apologetics can be found in the Bible eight times. The Greek word is apologia which means an "able defense of the faith." The most famous use of apologia is in 1 Peter 3:15, "Be ready always to give an apologia/answer." So, apologetics isn't about being sorry for anything. There are all kinds of apologists out there: Democrats, Republicans, Muslims, Christians, Mormons, and all kinds of other apologists out there. I am a Christian apologist. I stand on what the Scripture says. From the Bible I try to give answers and reasons for our faith. I am not apologizing for anything. Jesus carries all of my sorrows and He has taken care of all of my shortcomings. I'm not perfect, but I am forgiven. I'm helping people to understand the defense of the faith. That is what all Christians ought to be doing. At Take a Stand! we deal in apologetics concerning the cults. We deal with spiritual warfare, and really the whole genre of the ministry concerns spiritual warfare of some sort. I've written a book on the occult and how it has become popular in our culture. I deal with current issues in the Church, and that may be the thing I talk about the most these days. When you deal with the cults, you are exposing the false doctrines in the cults. That is another word called Polemics. So, I kind of mix these defenses of the faith together. Sometimes when you are defending the faith and expressing what the truth of Christianity is, you are also exposing false belief systems, so they go together. I even get into music having started my ministry with that topic. I was a rock musician for many years. I was a record producer and engineer. I was also a professional drug addict back in those days with a little longer hair. The lifestyle of it had an impact on me. I wanted to be like my heroes, my role models, who were the musicians in the 70' and in the 60's even before I first began to play. After I got saved back in the 1980's, I wrote three books about the secular rock music industry. From there our ministry slowly evolved into talking about cults and talking about the occult, and now of course dealing with the Church. In the next part of this series on the Emergent Church, Eric will explain what the movement's all about. What association, accredation society, church or chirstian organiazation deemed Barger an authority? He is an authority compared to what or who? Is it your ministry or his who deemed him as such? Seems like Eric has stepped on an emerging toe! Barger 'being an authority' in God's Word, by obedience to His Word; to 'test the spirits' and issue a warning that there are false prophets operating within the camp. All done by the highest authority given to us all, The Lord Jesus Christ Himself in Matthew 7. Is assuming a new gift of the spirit or does one assume because he/she is an authority. I am far from emergent. I just think Barger is only about barger and is using his brand of fear/sensationalism apolejetics to advance eric barger. Anonymous, remember that we're called by God not to judge one's motives, as only He knows them. When the Bible warns against judging (Mat. 7:1), it is speaking about judging motives. We can judge words and actions, though. I've know Eric for a few years now and appreciate his heart for the lost. we are you judge everyone. I believe Barger is a wolf in sheep clothing. I do believe the Lord warned us about wolves. Don't you know we are to judge angels? How much more the things on earth. Ever since Dave semi-retired this ministry went to sensationalism. There is a lack of biblical teaching too. I remember The old radio programs from the early 80's in dallas. What has happened to it. Look at how many times barger cites his own name before jesus. He has old information, speaks on a variety of subjects hoping that something will catch people's interest and toots his own horn continously. Anonymous, respectfully, you don't know what you're talking about. For one, the ministry semi-retired? We haven't been busier! Dr. Reagan alone has 4 conference engagements this month, we have 5 TV shoots and countless magazine, videos and so forth to publish. I'm sorry you miss the old radio program, but in this modern age feel free to listen to our weekly podcast. Eric is NOT a wolf in sheep's clothing. There's nothing to substantiate that. He has both Dr. Reagan's an my full trust. I'm not sure what your beef is with him, some perceived slight or something, but that's between you and the Lord. Anonymous said ‘we are you judge everyone’. Are you saying'we are to judge everyone'? If so that is false, all we can judge are the words (fruit) of a false prophet who are the wolves in sheeples clothing. Eric Barger does not fit that description. Instead he is exposing the wolves as per Matt7. What Jesus said about judging the brethren. John21:21 Peter, seeing him, said to Jesus, "But Lord, what about this man?" 22. Jesus said to him, "If I will that he remain till I come, WHAT IS THAT TO YOU? YOU FOLLOW ME"
Vs.4 Who are you to judge another's servant? To his own master he stands or falls. Indeed, he will be made to stand, FOR GOD IS ABLE TO MAKE HIM STAND. 10. But why do you judge your brother? Or why do you show contempt for your brother? For we shall all stand before the judgment seat of Christ. 12. So then each of us shall give account of himself to God. 13. Therefore let us not judge one another anymore, but rather resolve this, not to put a stumbling block or a cause to fall in our brother's way. i.e.In other words it is no one else’s business – everyone get on with their own life and follow Christ, and let the Lord take care of His own servants.